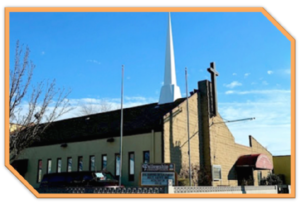 Here are some highlights of the history of Fellowship Covenant Church, located at 720 Castle Hill Avenue, Bronx, New York 10473. Our pastor is Reverend Kanyere Eaton. She is preceded by The Reverend Dr. Jerry Mosby, who pastored the Fellowship Covenant Church from 1979 to 2007 when he deceased. Before Pastor Mosby, there were 15 Pastors, all of whom have now gone on to glory. Fellowship was initially known as the Swedish Evangelical Immanuel Church of Harlem and was founded in the year of 1900, with a small membership roll of 32. The church was located on “Striver’s Row”, a thriving and prosperous locale in Harlem. At the time the congregation was comprised of Swedish immigrants. When African Americans began to take root living in the close neighborhoods of Striver’s Row, the Swedes began to lessen their presence in the church and moved to worship elsewhere. Soon after this, the congregation voted to change locations. They acquired the necessary funds to purchase property to build a second church located in the Bronx, near West Farms. The ministry was under the leadership of Reverend Dewy Sands. The population of this community district was in transition. In the mid-1960’s, Pastor Sands was instrumental in changing the complexion of the ministry by welcoming African Americans and Hispanics. The language spoken in the community had since changed to English. Pastor Sands also transformed the church by becoming involved with the East Coast Conference of the Evangelical Covenant Church. Through the grace of God, the Immanuel Covenant Church of the Bronx, as it was renamed, was gaining membership and ministries. The outstanding ministries included educational and cultural arts. There was also a building that had been erected to comprise a home for runaway adolescents and troubled young people who needed a home while away from home. “Samaritan House”, as it was named, was built next to the home where the Pastor lived. Changes continued for Immanuel Church. After Pastor Sands, Reverend Melvin Grey from Chicago was appointed as the first African American to pastor the church in the 1970’s. African Americans and those of Caribbean descent continued to increase the membership roll of Immanuel. However, after just 2 years of pastorship, Rev. Grey succumbed to ill health. In 1979, the East Coast Conference of the Evangelical Covenant Church, directed Reverend Jerry Mosby, another African American, to Immanuel Church. Always on the periphery of change and transformation, Immanuel was now to be led by this newly ordained minister. Reverend Mosby had recently been ordained by the late Reverend M. L. Wilson of Convent Avenue Baptist Church in Harlem, NY. Change of location was due again for Immanuel from the West Farms area in the Bronx; however it was not an easy process. The fifteen dedicated members of Immanuel explored various sites. A location in the Castle Hill section of the Bronx was selected. When the third new church building was completed, it had a capacity of 250 persons. The new church received the name Fellowship Evangelical Covenant Church, (FCC) affectionately known as “The Ship”. Fellowship Covenant Church has continued to grow. At the apex of its history, 2 services were held in the sanctuary each Sunday morning and each was filled to capacity. A new wing was completed and named, The Reverend Jerry Mosby Educational Building. In 2009 there was a renaming of the intersection of Homer and Castle Hill Avenues in Pastor Mosby’s honor. It is now known as Reverend Jerry Mosby Way. Reverend Dr. Jerry Mosby transitioned to glory on November 18, 2007. In May, 2010 the Fellowship Covenant Church members elected a new Senior Minister –The Reverend Kanyere Eaton. Pastor Eaton began her tenure on Sunday, July 18, 2010, and was formally installed on Sunday, September 24th, 2010. Pastor Eaton instituted creative bible lessons bringing programs geared for the men and the women of our congregation and re-developed the Children and Youth Ministry. The outreach and social ministries of Fellowship continue to develop. The number of ministries and committees on our church roster tops 21 including our children’s dance ministry, Congregational Care, Women’s Fellowship and Men’s Fellowship ministries. Also for men is Manna for Men, which meets on Sundays before our 10 am worship service, and a new ministry that will serve breakfast on Sunday mornings before service beginning this month. We continue to expand as our newly formed Castle Hill Resource Center begins to explore various ways to be a significant resource for this community.